How to outsource, share the load and drop the guilt. We all experience mama guilt. I’m sure you’ll agree with me on this one. Being a parent and being responsible for kids brings so many more shades of grey and so many more places and ways to feel guilty. It’s time to outsource, share the load and drop the guilt. Whether it’s the huge pile of laundry that seems to grow overnight or leaving your baby in the care of someone else as you trot off for your first day back at work, we have this knack as women of punishing ourselves with guilt. I had 12 months away from work to look after my first child and by default, ended up taking on more of the domestic duties in our household. It just happens subconsciously when your new workplace is your home. Between feeding my baby and their sleep times, I seemed to be forever doing the housework, folding the washing or putting on another load. 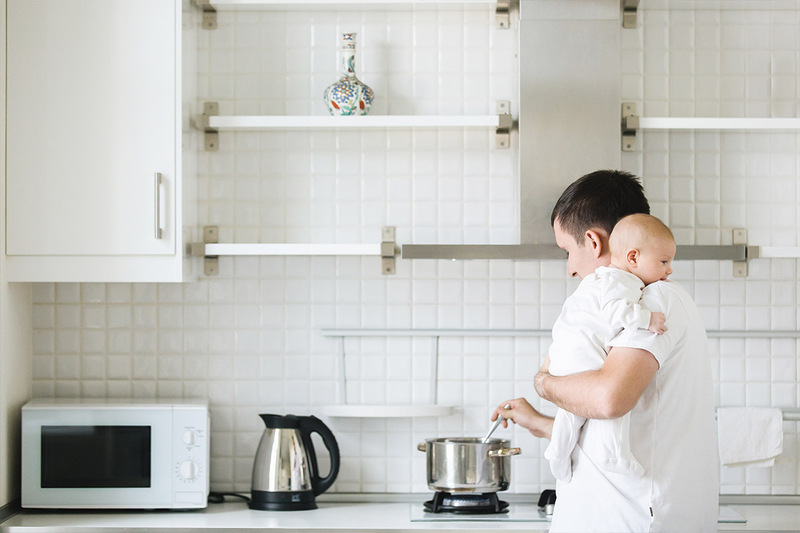 Prior to returning to work, it’s especially important to set yourself up in a way that is sustainable and allows you to enjoy your work and family life. Even in this day and age, women are still typically assuming the majority of domestic duties at home which may not only be holding their careers back but is also causing a heightened level of stress as they try to do everything plus more. The 2016 census showed us that the typical Australian woman spends between five and 14 hours a week doing unpaid domestic housework, while for men it’s typically less than five hours a week. I know, how crazy right?! Share the load: Parenting is the responsibility of both parents. If both parents are working, then ideally both should be contributing and sharing the domestic duties. Before returning to work, it’s a good idea to have an open discussion with your partner about how you are going to divide up these responsibilities. If your child is in care, how can you share drop offs and pick-ups? Washing, folding, cleaning, food shopping, preparation, birthday present shopping … the list goes on. Please don’t try to do it all as a mama. And on top of working. It’s just too much! Outsource, outsource, outsource: for the things that are not as important or you don’t enjoy doing, look for ways to outsource them. I figured that working four days a week, I then didn’t want to spend my weekends and precious time with my family cleaning the house. I understand that budget restrictions may prevent this being an option for a lot of people, but you can always reduce the frequency of a cleaner. For example, even a good monthly house clean will mean that you then only have a ‘maintenance’ clean during the week. Heard of Airtasker? It makes outsourcing easy. According to Alexandra Aguirre, Brand Marketing Manager at Airtasker, young families are the most consistent outsourcers, with 23% regularly outsourcing. “Cleaning is one of the most popular tasks on Airtasker. Our research also tells us that it’s also one of the most disliked tasks”. Other things to consider outsourcing are ironing, folding or anything else that you don’t particularly enjoy doing. Online food shopping is also a good option for time poor parents, especially if you are organised and have your regular shop set up in advance. The important things are important: start with an honest assessment of what the important things in your life are. Also, what are the things you enjoy doing the most? For me, I wanted to be around to spend regular and quality time with my kids. While daycare and a nanny were part of our regular weekly routine, this meant that I wanted to have a regular day at home with my kids and not be too tired and stressed out about work. So I negotiated working four days a week where I had the flexibility to leave at 4:30PM three days a week to pick them up from daycare and also work one day from home. Each week I looked forward to my one day at home with my kids where we would have some fun adventures together. Plan ahead so that you free up more of your time: there are times when you might need to work back late. Or you want to fit in some regular exercise or time for yourself to pursue your passion project. A clever way to do this is organise a nanny to pick-up your kids from daycare a few nights a week. Or you could share the caring responsibilities with a friend. For example, one day a week they pick up your kids after daycare / preschool / school and then the next week you return the favour.